Cool libraries in a melting world : Proceedings of the 23rd Polar Libraries Colloquy 2010, June 13-18, 2010, Bremerhaven, Germany. Edited by M. Brannemann and D. O. Carle. Berichte zur Polar- und Meeresforschung = Reports on polar and marine research, 620. Building polar networks : a strategy for the future. May 8-12, 2006, Rome.Edited by Silvia Sarti and Michela Cecconi. Rome : PNRA S.C.r.l., 2007. Polar Research: Let Us Share – Amiqqaaluta. 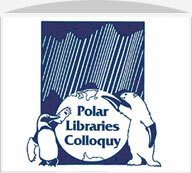 Proceedings of the 20th Polar Libraries Colloquy, June 7-11, 2004, Ottawa. Edited by Barbara E. Kelcey. Ottawa, Ont. : PLC, 2005. Poles apart – poles on-line. Proceedings of the 19th Polar Libraries Colloquy, 17-21 June 2002, Copenhagen. Edited by Kirsten Caning and Vibeke Sloth Jakobsen. Danish Polar Center Publication No. 10, 2002. Copenhagen : Danish Polar Center, 2002. Gateways, archives & libraries into the next millennium : proceedings of the 18th Polar Libraries Colloquy held at the Fort Garry Hotel, Winnipeg, Manitoba, Canada, 12-17 June 2000. Edited by Barbara E. Kelcey. Winnipeg, Man. : Hudson’s Bay Company Archives, 2001. Proceedings unavailable online at this time. Electronic information and publications : looking to the electronic future, let’s not forget the archival past : proceedings of the 24th Annual Conference of the International Association of Aquatic and Marine Science Libraries and Information Centers (IAMSLIC) and the 17th Polar Libraries Colloquy (PLC). / Addendum : Collaboration between scientific societies and libraries, benefits and arrangements. Edited by James W. Markham, Andrea L. Duda & Martha Andrews. Fort Pierce, Fla. : IAMSLIC, 1999. 16th Polar Libraries Colloquy, June 17 – 22, 1996, Anchorage, U.S.A.
Creativity, lighting the poles : collaborative solutions to common problems : proceedings of the 16th Polar Libraries Colloquy, June 17-22, 1996, Consortium Library, University of Alaska Anchorage, and Partial proceedings of the 6th Northern Libraries Colloquy, July 12-15, 1976, Elmer E. Rasmuson Library, University of Alaska, Fairbanks. Edited by Juli Braund-Allen and Cathie Innes-Taylor. Anchorage, Alaska : Consortium Library, University of Alaska Anchorage, 1997. Bi-polar information initiatives : the needs of polar research : proceedings of the 15th Polar Libraries Colloquy, July 3-8, 1994, Cambridge, UK. Edited by D.W.H. Walton, W. Mills and C.M. Phillips. Bluntisham, England : Bluntisham Books, 1995. 14th Polar Libraries Colloquy, May 3 – 7, 1992, Columbus, U.S.A.
International sharing of polar information resources : proceedings of the 14th Polar Libraries Colloquy, May 3-7, 1992, Byrd Polar Research Center, the Ohio State University, Columbus, Ohio, U.S.A. Edited by Lynn B. Lay and Lynn Tipton Everett. Columbus, Ohio : Byrd Polar Research Center, Ohio State University, 1992. Man’s future in arctic areas : proceeding of the 13th Polar Libraries Colloquy, 10-14 June 1990.Edited by Raija Kivilahti, Liisa Kurppa, Michael Pretes. Rovaniemi, Finland : University of Lapland, 1990. 12th Northern Libraries Colloquy, June 5 – 9, 1988, Boulder, U.S.A.
Twelfth Northern Libraries Colloquy : 5-9 June 1988. Edited by Ann M. Brennan and Martha Andrews. Boulder, Colo. : World Data Center A for Glaciology (Snow and Ice) and Institute of Arctic and Alpine Research (INSTAAR), University of Colorado, 1988. Proceedings of the eleventh Northern Libraries Colloquy, Luleå, Sweden, June 9-12. Edited by Terje Höiseth and Ann-Christine Haupt. Luleå, Sweden : Centek, 1986. Proceedings of the tenth Northern Libraries Colloquy, held at Memorial University of Newfoundland, St. John’s, Newfoundland, August 12-16, 1984.Edited by Judith A. Whittick and Barbara D. Rodden. St. John’s, Nfld. : Centre for Cold Ocean Resources Engineering, Memorial University of Newfoundland, 1984. Proceedings of NLC 9. Edited by Gøril Hessvedt and Louise Barnard. Tromsø, Norway : Universitetet i Tromsø, Institutt for museumsvirksomhet, 1982. Proceedings of the 8th Northern Libraries Colloquy, Edmonton and Whitehorse, June 1-6, 1980. Edited by G.A. (Nita) Cooke and Garth Graham. Edmonton, Alta. : Boreal Institute for Northern Studies, 1982. Arctica 1978 : VIIe Congrès international des bibliothèques nordiques = Arctica 1978 : 7th Northern Libraries Colloquy : 19-23 septembre 1978. Published under the direction of Jean Malaurie. Volume prepared by Sylvie Devers. Paris : Édition du Centre national de la recherche scientifique, 1982. 6th Northern Libraries Colloquy, July 12 – 15, 1976, Fairbanks, U.S.A.
6th Northern Libraries Colloquy, July 12-15, 1976, Elmer E. Rasmuson Library, University of Alaska, Fairbanks. (Partial proceedings published with the Proceedings of the 16th Polar Libraries Colloquy, June 17-22, 1996, Anchorage, Alaska). The collected papers of the fifth Northern Libraries Colloquy = Nordkalottens Biblioteksmöte, held at Rovaniemi Library, Finland, 26-30 May 1975. Collected by Salme Korhonen and Ros Weyland. Rovaniemi, Finland : Rovaniemi Library, 1975. Proceedings of the fourth Northern Libraries Colloquy : held at the Arctic Institute of North America, Montreal, Canada, June 3-6, 1974. Edited by Irene Coutinho. Montreal, Que. : Arctic Institute of North America, 1975. 3rd Northern Libraries Colloquy : Cambridge, England, 25-29 June, 1973.Cambridge, Eng. : Scott Polar Research Institute, University of Cambridge, 1973. 2nd Northern Libraries Colloquy, May 21 – June 2, 1972, Hanover, U.S.A.
2nd Colloquy on Northern Library Resources : Hanover, New Hampshire, 21 May-2 June, 1972. Hanover, N.H. : Corps of Engineers, U.S. Army, Cold Regions Research and Engineering Laboratory, 1972. Proceedings of the First Colloquy on Northern Library Resources : Edmonton, 16-17 June, 1971. Montreal, Que. : Arctic Institute of North America ; Edmonton, Alta. : Boreal Institute for Northern Studies, University of Alberta, 1971.